Instead of using Problem Statement, I would prefer to use Opportunity Statement for developing a good team as per Tuckman team development model. After passing 5 days class, everybody in the team is knowing each other, brainstorming, sharing the ideas and come up with Decision Support Package (DSP) which finally approved by The Customer From Hell (CFH). As per model given below, the performing stage should be reached as the time goes on. The highest score is 28 for Storming Stage which the team is in the Storming Stage. People begin to see themselves as part of a team. However at this stage we may challenge each other, and the team leader, about such things as what the team is doing, and how things should be done. This graph indicated when the class is over, people spread over and the communication set up differently by virtual as well as the learning curve is started. This is the final stage where increased focus on both the task, and on team relationships, combines to provide synergy. Performance is delivered through people working effectively together. 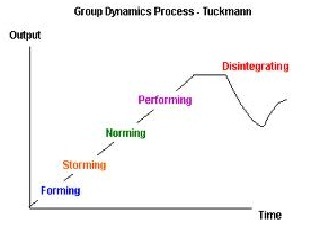 Particularly in the early period, which is perhaps why Tuckman called it the “storming” phase! Finding everyone’s “sweet spot” is not easy. We are working with adults, who have a job to do. We want to be on the same page, singing the same song (PDG’s presentation). When we have difficulties in communicating with others, think about the WIIFM and see if we are addressing the needs of the other person. This entry was posted in Candra Nugraha, Week #1, Weekly Submission. Bookmark the permalink. AWESOME, Mas Candra!!! Very well researched, written and cited. Given you have started out so well, I would hope you would be willing to mentor others on the team who may be struggling? Keep up the good work and looking forward to your future postings!! !